Trivia: Is fluent in Italian, English, French, Persian and Spanish. After assassinating her husband in Mexico City, Bond rendezvous with the fragile and stone-cold Lucia Sciarra in Rome. She is mourning her late husband, at grand ceremony attended by members of the top secret criminal organisation to which Marco Sciarra belonged. She responds coldly to Bond's jab that he sells life insurance and remains unimpressed with Bond's charms. "If you don't leave now, we'll die together." After tracing her to the grand Italian Sciarra family villa, Bond kills the men assigned to kill Lucia and convinces the kept woman that he's here to protect her. 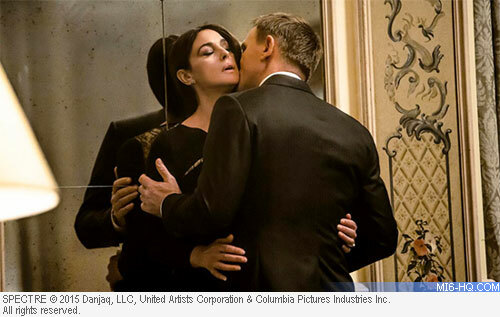 Seducing the long-suffering Signora Sciarra, Bond learns the location of the meeting of SPECTRE operatives. Scared and resigned to meet her death, Lucia's silence was her key asset whilst her husband was alive. But after 007 assassinates her husband, Marco, at the instruction of the late "M" (Dame Judi Dench), the lady's life is worthless to Sciarra's former employers. She knows little other than the cold shoulder her assassin-husband showed her and she did little to mourn the loss of Signore Sciarra. She gives into Bond's charms after he saves her life and Bond leaves her to examine the congress of SPECTRE agents; in doing so Bond reassures Lucia that his buddy Felix in the CIA will be able to give her safe passage out of Italy and a new life. She cautions Bond that involving himself with her will be signing a death warrant, yet Bond relishes in the risks and rewards. After appearing in SPECTRE alongside Daniel Craig, Bellucci was lined up to co-star in the Emir Kusturica project, "On the Milky Road" (2016). She appears on the screen with the director himself in the war-torn love affair, due for release in Serbia in September 2016.